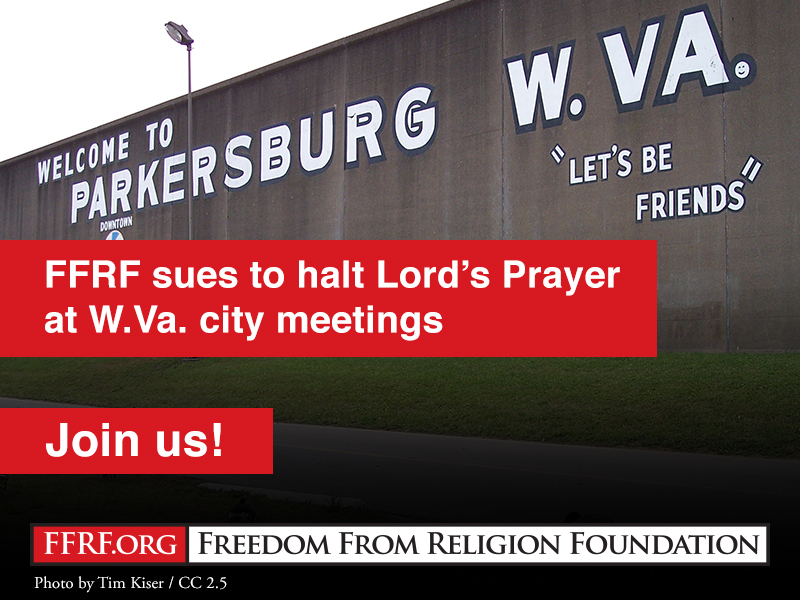 The Freedom From Religion Foundation is redoubling its efforts to immediately halt a West Virginia city council from unconstitutionally praying at every meeting. The city of Parkersburg has adopted and instituted an official Christian prayer — the “Lord’s Prayer” — that opens each City Council meeting, with city residents encouraged to join in. FFRF and two local residents filed a lawsuit in July in the U.S. District Court for the Southern District of West Virginia, Charleston Division asserting that the prayers breach the First Amendment, and also seeking a preliminary injunction to prohibit the council from continuing its practice. The city of Parkersburg filed a brief on Sept. 10 opposing the injunction. FFRF has now filed a reply brief in support of its requested relief. FFRF is taking its cue from this court decision. “Because this practice is unconstitutional under Lund, the court must preliminarily enjoin the practice to protect plaintiffs from continuing violations of their constitutional rights,” FFRF asserts in its reply brief. The local plaintiffs include Daryl Cobranchi, who has frequently attended meetings and been directed to stand for the Lord’s Prayer, a practice, he notes, which has made him conspicuous by his nonparticipation and which “assigns to second-class status anyone who is not Christian.” Likewise, Eric Engle, also a Parkersburg resident, follows city matters and has felt uncomfortable and pressured to participate in the Christian prayer during public meetings. Both men are FFRF members. This religious ritual is alienating to non-Christian residents. The magnitude of official endorsement of a particular religion is disturbing. The effect is to make the Parkersburg City Council meetings akin to a Christian church service. And what makes it worse is the official coercion. For instance, at one meeting, Councilman Eric Barber stared in a pointed fashion at attendees who did not participate in the prayer and shouted “Amen” into his microphone at the conclusion of the prayer. FFRF maintains that because the plaintiffs have demonstrated a likelihood of success on the merits, they are entitled to a preliminary injunction, which would directly address the actions of the City Council members and their unconstitutional practice of leading Christian prayers at each meeting. FFRF, acting as a plaintiff in the case as well, is a 40-year-old nonprofit corporation that advocates for the separation of state and church and educates on matters of nontheism. FFRF has over 32,000 members nonreligious nationwide, including more than 100 members in West Virginia. Last year, FFRF sued Mercer County Schools, W.Va., in a high-profile lawsuit to end 75 years of bible indoctrination in public schools there.